Dr Atul Bhaskar, one of the prominent Paediatric Orthopaedic Surgeon in India has graduated from Seth G S Medical College, Mumbai. After doing his M.S (Orth) from K.E.M. Hospital, he pursued further training in the United Kingdom. He was on the “Yorkshire Orthopaedic Training Program” and obtained his orthopaedic fellowship, FRCS (Orth) and Surgical fellowship, FRCS (Glasgow) degrees. He has received the M.Ch Orth form Liverpool. He has completed a dedicated Paediatric Orthoapedic Fellowship at the world renowned “ Hospital for Sick Children” in Toronto. He has also received training in Cerebral Palsy Management from Gillette’s Children Hospital, USA. 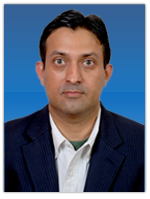 He has a strong academic and research interest in Paediatric Orthopaedics He has several international and national publications in leading journal and has presented more than 50 papers both at national and international fora on various aspects of children orthopaedics. He has also written a book on “Paediatric Fracture Management” He is a recipient of several international scholarships: Scoliosis Research Society, American Society of Cerebral Palsy, European Paediatric Orthopaedic Society, and International Paediatric Orthopaedic Symposium by POSNA.